Virginia Lake is an urban amenity of 28.5 acres and approximately one mile in circumference, with depths varying from 4-12 feet. Gulls and cormorants have rookeries on the island in the lake, along with other popular resident and migratory waterfowl including canadian geese, ducks, and the lakeside pigeon populations. Recreation at this city park includes active and passive recreation; walking, running, fishing, and birdwatching. The lake has an historic urban fishery enjoyed by residents and visitors, which is supported by trout fish stocking through the Nevada Division of Wildlife. Virginia Lake collects storm water from much of southwest Reno, including gutters surrounding the Caughlin Fire area's Manzanita Canyon and the Washoe County golf course on Plumas. Cochran Ditch also flows into the lake, carrying Truckee River water from the downtown Reno area into the north end of the lake. The only outlet to the lake in normal flows, is the glory hole, which carries water out from the northeastern end into the storm drain system and east, across Virginia Street and over to the Kietzke area, where it daylights behind the REI store and continues east. The flows follow a torturous path around the south end of the Reno-Tahoe Airport Authority property, and then easterly flowing into Dry Creek and the Boynton Slough. Once in the Boynton Slough, the water passes through Mira Loma Park and out to Steamboat Creek in east Reno, eventually heading north and returning to the Truckee River just above the Vista Narrows. Flows in Virginia Lake are typically not strong enough to provide aeration of the shallow lake water, and the Reno Parks Department installed three fountains in the middle of the lake (2002) to provide some level of aeration and prevent stagnant conditions from developing. Fountains were difficult to keep operational, expensive to maintain, and had technical difficulties. For these reasons, the fountains have been in various stages of disrepair over the last series of years. 1. According to a wildlife study published in 2007 (Skiles and Walker, Cormorants Nutrients and an Urban Lake Reno NV), Cormorants in Virginia Lake are consuming nearly 100% of stocked trout in the lake. NDOW has all but stopped stocking lake trout in this urban lake until the bird's nesting grounds, or rookery, (protected island) is removed. 2. Other wild birds forage for other sources of food, and urban sources of bread and other materials have supported a very dense bird population on the banks and island. Such crowded conditions have been shown to impair bird and other wildlife health in similar urban habitats. 3. The Reno-Tahoe Airport Authority has reported gulls and other birds, in flying between Virginia Lake and the Steamboat Creek area, encroaching on the flight path of commercial and military aircraft, causing a flight safety hazard. 4. Along with bacteria that may carry disease to recreationalists and urban pets, the bird populations provide a large amount of nitrogen and phosphorus to the watershed. Our Truckee River is currently regulated for both Nitrogen and Phosphorus, through a Total Maximum Daily Load (TMDL) which provides a numerical target intended to control pollution. Cormorants, through their piscivorous diet (which is heavy in phosphorus), may contribute more phosphorus to the lake than other birds-due to their diet. Removal of this particular population of birds, should have a great effect on the phosphorus loading into the lake and sediments within. 5. Besides current Cochran Ditch inflows, storm water from urbanized (paved) areas contributes significant non point source pollutants to ponding areas like Virginia Lake. Residential neighborhoods typically reflect elevated nitrogen and phosphorus through nuisance irrigation and other flows, or "urban slobber." In low-flow conditions, such as the 2013-2014 water year we are experiencing, ditches such as Cochran Ditch may be turned off earlier than most years, reflecting low water on the Truckee River. In such cases, the lake may evaporate more than usual, and the levels may drop. Critical water quality and habitat for fishes becomes impaired by pollutants in "urban slobber" much moreso than in higher water years. 6. Issues with the lake fountains include excessive trash (entering the lake via wind and storm water systems) clogging their intakes, and localized power surges causing motor problems. In the lower flow times of year (summer and fall), there is no circulation in the middle to south end areas of the lake, and stagnant conditions can prevail. Historically, there have been odor complaints during low-flow conditions. Data on water quality and biological conditions have begun to be collected, and will be through the coming years, to better understand what algal communities are like and how they are affecting the water quality in the lake. The Department of Wildlife will suspend stocking activities in the Fall of 2014, with intentions of working to improve habitat in Virginia Lake with the City of Reno. Once an assessment is made using water quality and a biotic assessment as a Best Management Practice (BMP) for lake management, the City of Reno will craft a phased plan, working with stakeholders to embark on community outreach and planning for water quality improvement projects to improve the common resource that is Virginia Lake. 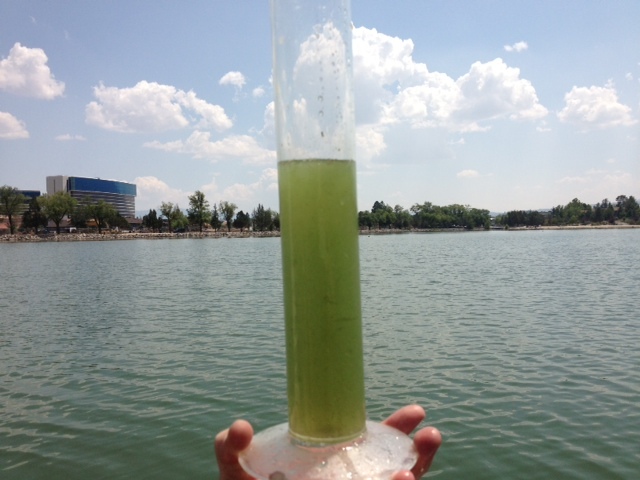 The City of Reno has been monitoring water quality and algae in Virginia Lake. 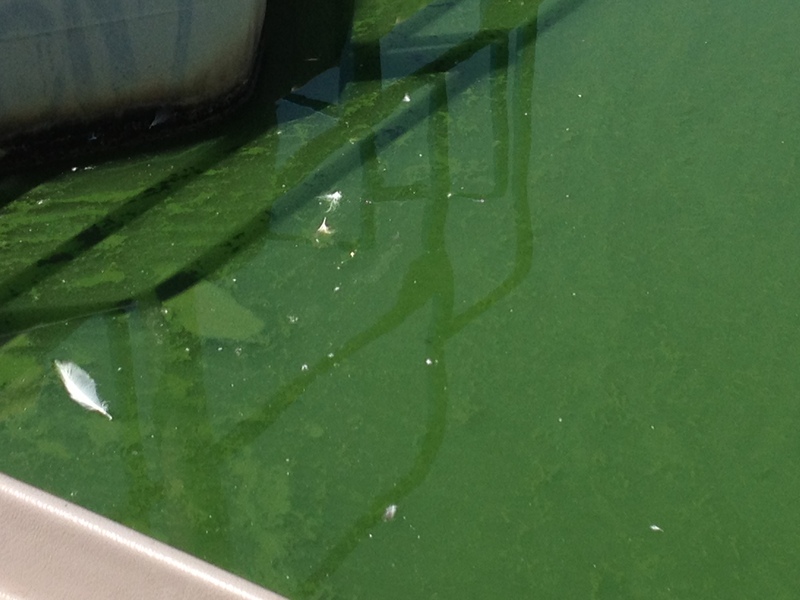 The low flow year, paired with bird waste causing nutrient enrichment in the water, has caused a bloom of blue green algae. Blue green algae can cause unsafe conditions for pets to wade in or drink the water. Scientists have detected toxic bacteria coming from the algae - this is an unpredictable and readily changing status. As of 8/27/14, NDOW and DRI scientists sampled water and soil around Virginia Lake and detected 3 and 5 ppb of cyanotoxins known as microcystins. From DRI:- we did do at test on 4 samples from the lake for the general class of cyanotoxins known as microcystins and found the 5ug/l of the toxin in the sample from the North end- where there is a brilliant green bloom occurring on the mudflat. The other samples from the E, W and S ends all indicated 0 ug/l. Of note- however- I did find some of the colonial Microcystis that is often the culprit when the microcystin toxins are produced. This class of toxin is one of concern for public health as well as for fish, birds and mammals- especially when ingested- as it is a potent hepatatoxin. I have also attached a link to an EPA document that talks about cyanotoxins. 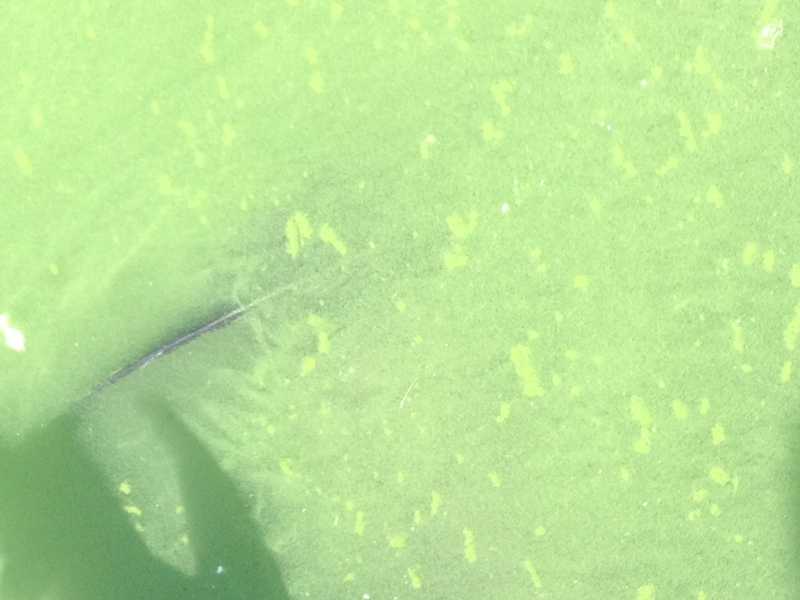 The density of blue green algae has created conditions which can be toxic to fish and other aquatic organisms. Blue-green algae thrives in standing water with ample sunlight, shallow depths, and nutrients including nitrogen and phosphorus. The island on Virginia Lake, that provides nesting for cormorants and gulls, provides a direct input of such nutrients to the lake constantly. Storm water inputs also provide concentrated nutrients in gutter flows feeding the lake from our residences. Working with Nevada Division of Wildlife, the Nevada Department of Environmental Protection, the Reno Tahoe International Airport, USDA-APHIS, Truckee River Fund and other stakeholders, the City will embark upon the first phase of a water quality improvement project at Virginia Lake this fall. The City will continue gathering data, and allow science to inform future steps taken on the lake. The project will reduce nutrients entering the lake, and provide for circulation to reduce stagnancy in the system and eutrophic conditions with blue green algae blooms. Monitoring and lake management contract: ongoing. Implementation 2014, 2015 before and support through any phases of construction. Circulation system. Partner contributions: Silverwing Developments: $116,000 dedicated. 90% design anticipated Spring 2015, Construction/Implementation Fall 2015. What can you do? Keep your pets and children out of the water in Virginia Lake. Do not fish in the lake until NDOW restocks it. Help the lake by not feeding the ducks, geese and other waterfowl. Choose to reduce storm water overflows from your property into the sidewalk and gutter. The gutter system feeds the storm drains, which empties into the nearest waterway, and eventually the Truckee River. Over 4.3 square miles in the southwest area of Reno drain directly to Virginia Lake, and then later, the Truckee River, see map attached. Ways to reduce your nutrient runoff at home include using commercial car washes rather than washing at home. Prevent overwatering at home. Turn off sprinklers if storms come, and reduce your timer so the sidewalks are not wetted by runoff and fertilizer from oversaturated lawns. Sweep up all spilled lawn care products, never allow products to get into a ditch, the gutters or storm drain system. What grows green lawn, grows algae too. Of course, always clean up after pets and fruit trees, and keep dumpsters covered. Visit www.tmstormwater.com to learn more about how to reduce your impacts to the lake and our precious Truckee River.